Boy choristers should be 8 or 9 years old in September of the year which they enter the choir. They leave the choir at the end of school year nine (when the chorister is about fourteen years of age) or when their voice breaks. Girl choristers may enter the choir aged 8, 9, 10 or 11 (school year seven), and may also stay in the choir until the end of year nine. For both boys and girls voice trials are held in January of each year for the following September, but enquiries about joining the choir may be made at any time. Choristers receive a world class musical education singing in one of the most beautiful cathedrals in England. Wells Cathedral School provides a first class academic education and is one of the finest specialist musical schools in the country. Choristers have the opportunity to sing on international tours, commercial recordings and radio and television broadcasts. They also learn how to organise their time and develop the essential life skills of self-reliance and self-discipline working as a team member seeking the highest possible standards. Experiencing and contributing to a profound quality of worship nurtures a chorister’s spirituality and helps them grow in their understanding of the Christian faith. The choristers develop close friendships and have a lot of fun! Essential in all of this is the support of the parents and family given the demanding schedule and commitment required. We are looking for alert and keen children with a love of music. In the first instance we are not looking for any sophisticated musical training but a clear voice with good high notes and a good musical ear. It is important that being a chorister is something that the child wants to do and not just the parents. 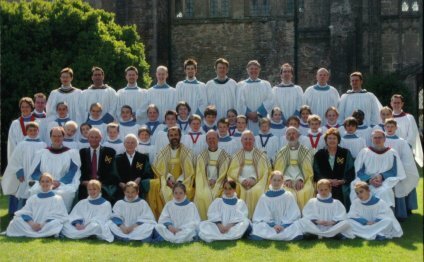 Could your child be a Wells Cathedral Chorister?